The EPFL spin-off BestMile – based in Lausanne and San Francisco – developed a system for autonomous vehicles. Recently the startup closed a $2.5M seed funding. The round was led by a business angel from Zurich with participation from Perot Jain, Forticap SA, and private investors from Switzerland, Germany and Silicon Valley. CEO Rapaël Gindrat talks about the deal and the next steps for BestMile. Co-founder and CEO of BestMile Raphaël Gindrat and co-founder and CSO Anne Koymans. Pic: Tina Sturzenegger. Raphaël, can you tell us a little bit about your background? I graduated from the Swiss Federal Institute of Technology in Lausanne (EPFL) in January 2014. I hold a Master’s degree in Civil Engineering with a specialization in Transportation. I gained my management skills through a minor in Management of Technology and my 2-year term as President of the EPFL Student Association (8,000 members, CHF 1M yearly budget). I co-founded BestMile in 2014 and I am currently the CEO of the company. My expertise comes from my early involvement in the world of autonomous mobility. During the last year of my studies, I worked for the EPFL vice-presidency, focusing on the European project CityMobil2. What is BestMile? What problem do you solve? BestMile is a Swiss startup with offices in Lausanne and San Francisco, developing cloud technology that leverages the full potential of autonomous vehicles to tackle urban mobility challenges. A spinoff of the Swiss Federal Institute of Technology in Lausanne (EPFL), BestMile provides a fleet management platform designed to connect, operate and optimize any fleet of autonomous vehicles. It manages both scheduled trips and on-­demand service, and is independent of any vehicle manufacturer, thus allowing mobility providers to remotely manage heterogeneous fleets composed of autonomous vehicles of different types and brands. With its cutting-edge technology, BestMile is shaping “individual robots” into an intelligent, innovative and flexible mobility system. How did you come up with BestMile? Was it born at EPFL? 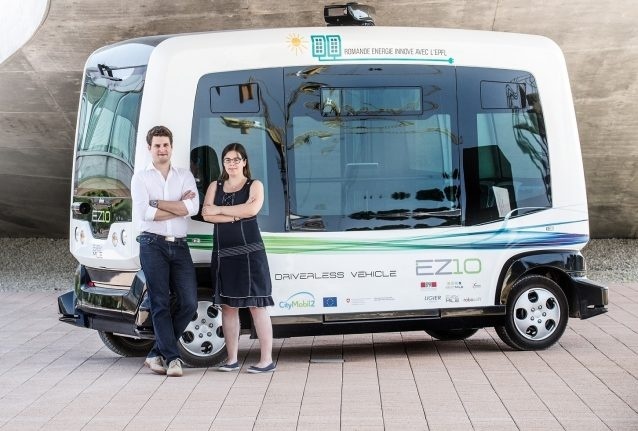 The idea was born in EPFL, first when I worked on the first autonomous shuttle purchased back in 2012 and then while working on EPFL’s application for the European Pilot project CityMobil2. We realized that there were no companies providing a solution to operate autonomous shuttles as a transport system. Are there competitors out there? The numerous exchanges and interactions BestMile had with transport operators and autonomous vehicles manufacturers along its two and a half years of existence conclusively showed that no other company on market is currently offering an active and agnostic fleet management platform for autonomous vehicles. While autonomous vehicles manufacturers might develop their own fleet management solutions they will most likely not make it compatible with their competitors’ technologies. A fleet management solution that doesn’t allow the operation of a fleet composed of vehicles from different manufacturers is very restrictive and doesn’t make sense in a context of global urban mobility. There is an indubitable need for fleet management actors entirely independent that will, like the tower control of an airport, manage and optimize vehicles from different brands operated by different companies. n summer 2015, EPFL hosted one phase of the European project CityMobil2. BestMile was in charge of the daily fleet operation with its own technology. Thanks to BestMile active participation in the project, the company became the first fleet manager in the world to remotely operate a fully automated transport system. CityMobil2 was the framework to launch BestMile mobile application allowing passengers to have on-demand service. At the same time, all the data gathered and the results of the project proved BestMile’s technology was on the right path. The autonomous shuttles in Sion. The “SmartShuttle” project in Sion in collaboration with PostBus was just publicly launched on June 23rd. The goal of the project is to find out if and how the service of autonomous shuttles in the public sphere is technically and operationally feasible and if it offers an added value to the customers. Whether or not it is possible to use the autonomous shuttles in public areas, e.g. in pedestrian and car-free zones, or on company premises is being specifically called into question. However, the objective is not to replace buses on existing routes with autonomous vehicles, but rather to diversify the transport modes in order to cover as many passenger mobility needs as possible. The hope is to find new mobility solutions for public transport, at the interface with private transport options. It is also a challenging opportunity for BestMile to demonstrate the efficiency of its technology on real life conditions. How did the customers react to the “driver-less” shuttles? So far, we’ve only received positive feedback and people are thrilled to try out the shuttles. Passengers are very curious about the technologies and how the whole system operates. The questions revolve around the same topics: Does it really work without any human operator? How does it detect obstacles? Passengers are impressed like they would of a magic trick, but they know it is not magic but advanced technology. 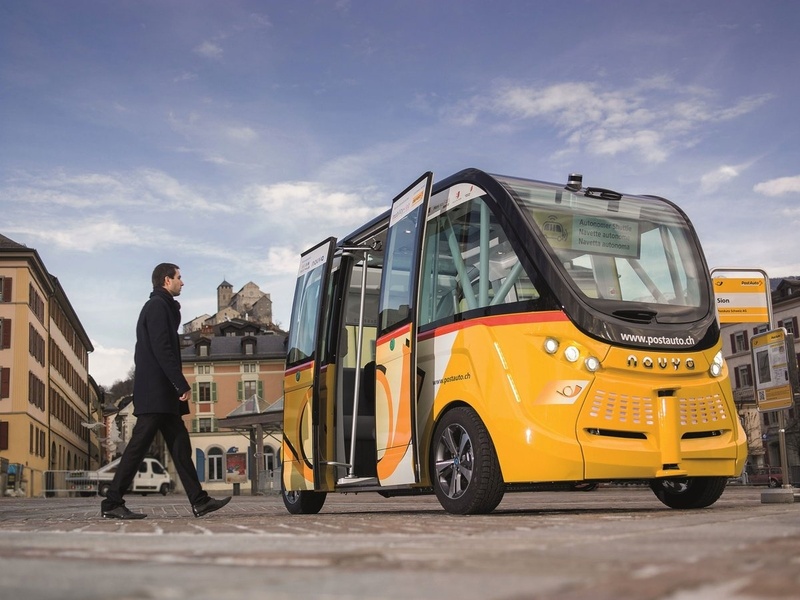 In addition, many other cities and transport operators have reached out following the announcement of the project in Sion to discuss the possibility of using autonomous shuttles combined with our solution to offer a comprehensive autonomous transport system. We are convinced that even before the end of the project in Sion (2 years from now) numerous cities and private sites will be equipped with their own autonomous transport system. Recently you closed a seed round of 2.5M. Who invested in your company? The round was led by a renowned Swiss technology investor based in the Zurich area and completed by the US venture capital firm Perot Jain, L.P., Forticap SA based in Geneva, and private investors from Switzerland, Germany and Silicon Valley. The funds will be used to rapidly scale the team internationally, accelerate R&D development, and boost growth through business development and partnerships with cities, vehicle manufacturers, tech companies, and mobility providers. With this investment we hope to move forward to achieving our vision for mobility. Urban mobility is one of the most baffling challenges for cities all over the world. Demographic change and urban population expansion are putting pressure into cities saturated public transport infrastructures. At the same time, people are becoming increasingly aware that transportation is one of the biggest cause of greenhouse gas emissions, in addition to deteriorating the living conditions inside the cities. The future of mobility isn’t in autonomous vehicles themselves, but in what they can offer when they’re operated and managed collectively in an integrated ecosystem. In the long run, and at the scale required to support thousands of autonomous vehicles, there is an even greater need for a global fleet management solution to optimize real-time dispatching and routing, network between fleets, and reduce the ecological footprint. What are other benefits those investors will bring in to the company? Most importantly, besides the funds, each investor is bringing his qualified network and expertise, which are essential to support a rapidly growing startup. We are very fortunate to benefit from the know-how of our accomplished investors and serial entrepreneurs to help us move efficiently towards our vision for accessible mobility and sustainable cities. You were part of the venture leaders by venturelab journey last year. How did that trip help you to grow as a company? Being immersed in ecosystems highly concentrated in brainpower and counting one of the largest network of venture capitalists in world was an unforgettable and enlightening experience. The program was complete and had an extremely well thought balance between classes, meetings and exchanges. In addition, spending the journey alongside with other startups taught me a lot. Even if our startups were not in the same field, we were all facing the same challenges. Later stage startups were able to give advices to earlier stage ones and everyone was able to share its experiences. Did it help to get in contact with Perot Jain? While this journey didn’t directly lead to our encounter with Perot Jain, I am convinced that what I’ve learned during Venture Leader was a key factor in the success of our discussions but also in making BestMile what it is today. You took part of the Startup Essentials last year. Tell our readers what you learned there. The series of workshop Startup Essentials, offered by venturelab covered efficiently all the tools I needed to move forward with the development of BestMile. I especially liked the workshop on value creation and strategic clarity, which are, two of the most tricky challenges startups face. I recommend it to everybody because I believe it is an unique and incredible opportunity. The main next step for BestMile is to scale the team internationally which is one of the biggest challenge for startups. In parallel, we will focus on accelerating R&D development and securing our technological lead. Last but not least, we will also boost growth through business development and partnerships with cities, vehicle manufacturers, tech companies, and mobility providers. In order to fulfil our vision and offer a complete autonomous mobility solution, we’ve already partnered with various autonomous shuttle manufacturers, including France-based Navya, US-based Local Motors, and most recently with NEXT Future Transportation, an advanced smart transportation system based on swarms of modular self-driving vehicles. New collaborations will be announced in the near future and will expand BestMile’s portfolio of partnerships to advance autonomous mobility.